What’s up everybody?! Paul Shakuri here with some more door to door mastery info! We are going to be discussing something that you may get often. You know that one pocket of turf that seems to be more difficult than others?! Well, keep reading on, because I have answers for you! 1. Now is not a good time! 2. I am not interested! 3. My husband isn’t home! It appears that they are getting these responses right from the beginning of conversing with the potential client. People are not at all engaging with the sales rep! They are instantly getting hit hard with rejection! So you can ask yourself, what is going on here? It is common that you find these pockets in specific areas. What is typically happening in these areas is that there is a number of excuses that people typically believe in. In this case, they sell residential and commercial security products and services. They are one of ADT master dealer of all of Canada. They basically came to me and said there is no crime in this city. There certain there’s no crime in the city. People are saying it’s a really safe neighborhood and no one really wants the service or product. I asked my corporate client how they felt about this! The response was that there was no blame towards anyone because if there is no need for the product then it’s understandable why people are not purchasing it. The belief that the city was safe was constantly being stated. The first lesson here, be careful of what you think! Be careful of what you tell yourself! I simply had a thirty-minute conversation with the corporate client and pulled up the city on my computer to look up the crime rate. When I pulled it up I found that when we dove deeper, we found the amount of crime rate in that city. Now, I would use a screenshot of that city and place it on my phone to show potential clients. Of course, I would not use it as a tactic to scare them but to just make them aware of what is going on in their neighborhood and surrounding area. I am going to say it again, scaring people is not the way to get more sales! Reverting back to what we found online, we found that there were 85 crimes in 15 days within that city. A crime rate of 85 in 15 f-ing days! Really?! Do you see how door knocking can be a full-out emotional game? I don’t sell the residential and commercial security based on fear. I don’t sell pest control based on fear. I don’t sell solar based on the notion that you need to save a couple bucks. That’s not the way you make money in door to door sales. The way you are going to make money is understanding your products and services but also understanding what method of sales to use in what neighborhoods! In this particular situation, this neighborhood needs a little more assertiveness! Finding the right amount of aggressiveness on how you communicate with the potential customer! Every person that typically lives in cities of smaller residential areas believes that it is “safer in these smaller towns or areas and that they don’t have as much crime.” Why do people believe this? The answer was solved on the phone call I had with my corporate client. The reality is that the media doesn’t cover what doesn’t make them enough money. The crime rate is the same as other places where people are knocking that they have scared the living bleep out of people. So what’s changed in these neighborhoods is that people have the fixed belief that it is a safe neighborhood. The reality is it’s not so extremely safe. So how do we resolve this problem?  Understand and figure out what’s going on! You can then come up with logical reasons and solutions to the problem and how to solve the problem. For example; in this case, you are doing security, if you knock on a potential customer’s door and discuss crime, what is going through the person’s mind?  First of all, you sound like a door to door sales person!  Of course, this person is going to tell me about crime. They are selling security systems. 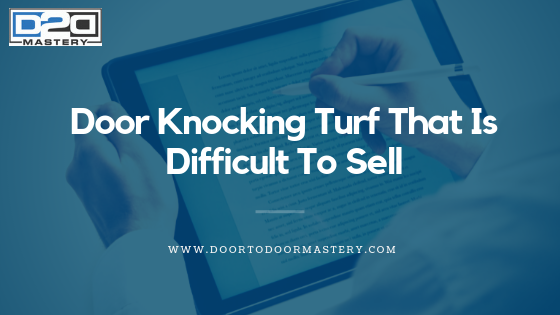 You need to understand what your selling and how to actually present it. Me: “hi, are you the owner of the property here? 1. Rebuttal: You have to ethically close those deals! Remember in an ethical way! There is that process and you’re going to have some rebuttals. The first thing you do in a rebuttal is you agree and then you move forward. I agreed with the customer! 2. Buy time to let them know that your time is limited. Simply if the customer is being blocked they will not be able to absorb what it is you are trying to offer them. 3. Alleviate the pressure of you being the salesperson. You alleviate the pressure by letting the customer know you have another place to be as well. 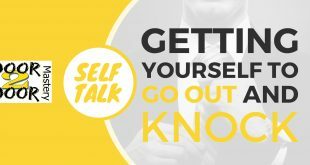 This brings the customer down to thinking that you are just not a sales person and it brings them to absorb the information about the products and services you are trying to sell. If you do not understand this, then you can get more in-depth with my Masterd2d.com program. Or you can email me at pshak@doortodoormastery.com. Let me know exactly what you’re struggling with! If you ask questions you’re going to slowly figure out what you’re not doing that you need to do. Remember, at the end of the day, if you are going to beat yourself up and self-sabotage yourself, and start believing the crap that people and yourself get told! By the way, my corporate client’s competition told him this area is bad. In my head, I thought, this is the gravy turf and this is why they like it. So my question to you is, how bad do you want to close more deals?! Thank you so much! Peace!